Here I come with another perfume review... actually while clearing my dresser, I caught hold of a lot of perfume sample and old perfume bottles with some content still left in them... so here I go on a Fragrance Review frenzy. The New version of Miss Dior Cherie was launched in 2011 and I can't seem to remember how I got hold of this sample vial but I do remember how excited I was to find it in my stash. The bottle design is elegant and feminine. The new version is being created by Francois Demachy who combines essences to contribute to more sophisticated presentation of Dior's Cherie. The fragrance is defined as Fruity Floral Elegance. Somehow all my favorite fragrances for past years are dominated with floral or fruity notes and ending with musky and woody notes and this was no exception. The fragrance opens up with heavy notes of mandarin orange, soon giving way to floral Jasmine notes, which is too sweet and lingers on for a while longer than I would usually like but as it give way to the base notes- I could smell patchouli with a hint of sandalwood, which seems to last forever. Really enjoy this transition every time, I wear this fragrance. It is not very long lasting considering it is an EDP, around 5-6 hours. I would say it is fruity and floral yet not overpowering. It is truly an elegant, feminine and sophisticated fragrance. Retail Price- S$140 for 30ml, S$150 for 50ml and S$210 for 100ml. 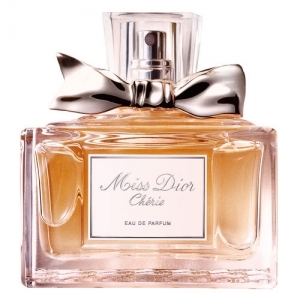 Have you tried Miss Dior Cherie EDP? How do you like it? Or if you have not tried it yet, would you like to try? What makes you want to try it? Do leave a comment and share your views and experience with us. Follow on Neha Suradkar on Vanity Trove to know my beauty likes and dislikes and more product reviews.